Please read this information carefully and follow the instructions below. We recommend that you bookmark this page for future reference. In order to secure your place on the programme, you are required to complete a UK DBS (Disclosure and Barring Service) check. I currently live in the UK but within the last 5 years, I have lived abroad for more than 6 months (when I was 16 years and older). Please be aware that it could take up to 6-8 weeks or more for DBS Service to process applications. Therefore, it is important that you complete the application and ID checks as soon as possible as you will not be allowed to start on a course or placement until the full DBS process is complete. b) Attend one of our Admissions drop in sessions to complete a face to face ID check. You will need to bring along the original documents you selected within your online application. If in doubt, please bring few additional documents from the list attached here. This will allow us to verify your identity and make sure that the information that is sent to the DBS is correct. You should allow approximately one hour for this appointment. If you are currently living abroad and need to complete a UK DBS check, but are not able to travel for your face to face ID check, then please let us know. Once ID check is complete, you will receive a link to finalise your DBS application. Until you have completed this final stage, your DBS application will remain incomplete. NOTE: You can complete this step at the drop in session when you come in for the ID check. If you have not lived at your current address (UK/Overseas) for the last 5 years, you will be required to bring the address history to complete Step 2. You will receive your DBS certificate in the post to your current address. If your DBS Disclosure Certificate contains information, then please make an appointment via email (DBSUnitCCG@mdx.ac.uk) to see a member of our Compliance and Governance Team as soon as you receive your certificate. 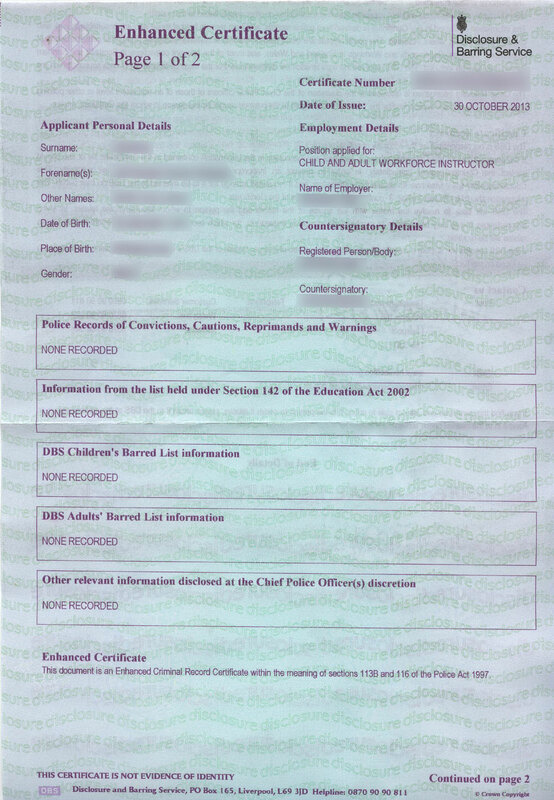 If your certificate does not contain any information, then no further action is needed for now. In both cases, please keep the original certificate safe for you as you may be asked to show this to your placement provider. Please note that if the University receives a DBS Disclosure that it considers to be unsatisfactory or if you fail to declare a conviction, caution, reprimand or final warning and the discrepancy comes to light after you have taken up your place, the University reserves the right to withdraw an offer of a place or to terminate your programme of study. If you are signed up for DBS update service, please bring your registered certificate which should be the original Enhanced DBS Certificate to one of our Admissions drop in sessions. Please also ensure that you bring 3 or more valid ID documents with you (please consult Documents List in the UK DBS check tab above) in the case that your DBS Update Service cannot be accepted and we can carry out a new DBS check. If you have previously lived outside the UK for more than 6 months within the last 5 years (when you were older than 16 years), then you will also need to complete an Overseas police check form. You will be required to provide a police check from the country or countries that you have lived in outside the United Kingdom during that period unless you have UK Certificate of Naturalisation (if you have not resided outside of the UK, since its issue). You will need to complete part A of the form and have part B completed and stamped by a competent authority such as your Embassy, High Commission, Consulate or other official government department/agency of your country. For further guidance for your country also please refer to https://www.gov.uk/government/publications/criminal-records-checks-for-overseas-applicants. The Overseas Police check must be in the English language and issued within the last 12 months to be accepted. Please bear in mind that you may be charged for the Overseas Police Check and this will be at your own expense. If you entered the UK with refugee/asylum status, then you are not required to provide an Overseas Police Check. You are required to complete and return an Occupational health form which must be valid within six months before your commencement date. The final page of the form needs to be completed by your GP (Doctor) who will be required to provide information concerning the number of times you have been to see him/her in the last 5 years, childhood illnesses, any known physical abnormalities and details of your vaccination(s) record. Some GPs (Doctors) may charge for completing this part of the form and regrettably any expense incurred will be your own responsibility. Please make a copy of the Occupational Health Form before returning it and keep it for your records as you will need to bring a copy to your occupational health appointment which will be arranged for you when you start your course. Any details will be treated with strictest confidence. Late completion or non-completion of your Occupational Health Form will lead to you being discontinued from your course if health clearance is not confirmed by the occupational health nurse on day one of your placement. Hepatitis B and Hepatitis C Infected Healthcare Workers. More information for Nursing and Midwifery offer holders can be found here. Please read this guidance before completing the Fitness to teach declaration. We are required by the Department for Education (DfE) to determine, that all students beginning programmes of ITT have the health and physical capacity to teach and will not put children and young people at risk of harm. We are committed to ensuring equality of opportunity for students with health conditions and disabilities. The University will provide all reasonable support to enable students with any disability or health condition to complete an initial teacher-training programme. Some health conditions or impairments might need further assessment by a health professional so if you make a positive declaration on the Fitness to Teach declaration, it is important that you then complete the health questionnaire. Your response to the health questionnaire goes directly to our Occupational Health Services team. Please see below for examples of impairments or health conditions that might require further assessment. Please note that we can only consider adjustments for school-based training placements if the health condition or impairment has been assessed by Occupational Health. The Middlesex University Disability and Dyslexia Service provide guidance and support for prospective and current students. If you have any health condition or learning impairment that you think may need additional support we strongly recommend that you talk to our Disability and Dyslexia Service as well as your Programme Leader. We strongly advise that you inform your programme leader if you are a new or expectant mother. Appropriate risk assessment of placement settings can then be arranged to ensure that you are not exposed to hazards in the work place that may pose a risk to you or your unborn child.